I promised you more ideas for using Freezer Paper. I love this stuff! It is probably the most versatile product I keep in my sewing studio. Once, when I was teaching a class that didn't require freezer paper, I thought of a way to use it to make a part of the class easier. I looked around for that familiar blue box and realized I didn't have any with me. One of the class participants said I looked like I was going to go into withdrawal! She quickly went to the kitchen and pulled out that blue box, and she noted that I visibly breathed a sign of relief when the box came into view. " My name is Elsie, and I am a freezer paper junkie!" The little wall quilt to the left is simply called "Rose Bud with Vase" and it is painted using freezer paper stencils, acrylic craft paint, and Sharpie markers in a variety of colors for the details. The frame is hand-painted with Setacolor fabric paint. Basically, all you need for this process is freezer paper, fabric, craft paint, a small, sharp scissors, iron and ironing board, stencil brushes and water and paper towels for clean-up. You can draw your own design, or use coloring book drawings, or clear photographs for your stencil design. I like to use Dover Publication's copyright-free design books for needleworkers and crafters for my designs. Some of these inexpensive books also come with CD-roms that you can insert in your computer and then print out in any size. Once you've created your design, you'll need to separate the parts into stencils. Parts that have edges that touch must be in separate stencils. I try to group the parts by colors whenever possible so that I can paint all of one color at the same time. 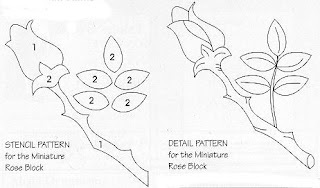 For example, this Miniature Rose Bud takes 2 stencils, (2 separate pieces of freezer paper) one for the stem and rose bud, one for the leaves and calyx. Next, mark the openings on each piece of freezer paper, and carefully cut them out with small-bladed, sharp scissors. Adhere the first stencil to the right side of the fabric with a hot, dry iron. Apply the appropriate color of paint through the opening in the freezer paper stencil with a stiff bristle brush. Do NOT thin the paint with water. Doing so will allow the paint to 'wick out' and under the freezer paper edge, making a rather ugly blob of paint. There is no need to use fabric extender. The extender or fabric medium only keeps the paint wetter longer. You will want the paint to dry quickly. When the paint is dry, carefully remove the first stencil. It can be re-used if you can keep it intact while removing it. Adhere the second stencil in place. You can actually see through the freezer paper for positioning. If you still have trouble, you can actually put your original pattern under the fabric, and you can see where to position the second stencil. It may be necessary to hold it up to a window or you can use a light box. When satisfied with the position, apply the paint for the second stencil. Continue in the same manner. When all the paints have been applied wit h stencils, remove the last freezer paper stencil. Use a little paint and detail brush or inks to add lines, fill in gaps, and paint fine details. I used a detail brush for the leaves, and inks for the fine lines and outlines for the Rose Bud with Vase. With a little practice, this is quite easy. If you are not confident enough to do the finishing details free hand, lay your fabric piece on top of your original pattern. You should be able to see through the fabric to trace the lines. If not, use a light box or window. 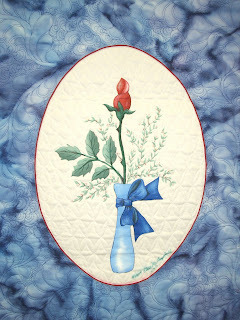 If you would like a copy of the Rose Bud with Vase pattern, you can e-mail me directly at: n2quilting@yahoo.com, and I will send you a pdf that you can print out and use. This is the class project I use for teaching for my workshop entitled "Fancy Floral Freezer Paper Stencils". Here are some other freezer paper-stenciled projects I've made. The first one is the alternate block of my quilt Triple Trio of Stars. 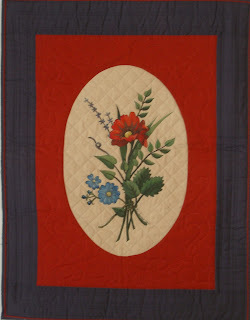 You can view the large quilt in my Gallery of Quilts on my website. The second one is a wall quilt made using a copyright free design from a Dover Book. Hope you will have lots of fun trying freezer paper stenciling, and send me pictures of your stenciled block(s) and/or quilts! I love getting pictures of what you are doing, too! Hi Elsie! This is a really cool method. I'm a freezer paper addict, too, though I've never used it in this way. Thanks for sharing! Thanks for your response, Nadine. Had to look you up to realize that we are Facebook friends, too, and when I saw Paisley Pavane, everything fell in place! Your blog is wonderful and I've enjoyed reading some of your posts. Thanks for following mine, too. Zegi, Triple Trio is a bed quilt, and has been laundered 3 times. Not a problem except when I was hand quilting it. I had to stab-stitch through the painted areas. After 12 years of being packed and unpacked lots of times, the white areas are showing a little wear, but all I would have to do is touch up the paint a little. 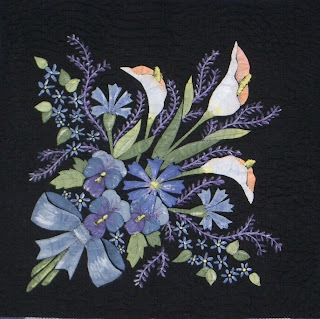 My newest quilt Tulip Time is completely painted with Gladys Grace stencil paints. These are formulated for use on fabrics, and they are quite soft. But the color selection is quite limited, so I had to mix my own colors in enough quantity for all 12 blocks at one time so as not to have problems matching them. Thanks for your comment. P.S. A photo of Tulip Time appears with my newest post. It is the one with a yellow background, and wreaths of tulips on it. The tulip motifs are freezer paper stenciled, painted, and inked.